Being of Latin American culture, the Brazilian traditions and customs are of immense diversity, with important influences from Europe, the indigenous South American people, people from Africa and Asia. Also largely influenced early on in its history by the Portuguese's colonisation, Portuguese language and many other of its cultural elements, Brasil has evolved into a society that exudes mixed unity; a claim many countries pride themselves on, yet come no where near to achieving the Brazilian harmoneous multi-cultural society. The mere mention of Brazil or Brazil people, is synonomous with Brazilian soccer, Brazil carnivals and beautiful sunny beaches. While these are all wonderful aspects of the Brazilian culture and traditions, they are by no means the best of everything Brasil has to offer. The culture of Brasil happens to be a real mixture of different races and ethnicities, all of which of course, add to the Brazilian diversity. Unlike most other Latin American countries where the Indian population is obvious, in Brazil's case there is no such distinction. Interracial marriages have taken place to the extent where there is a blurring of racial lines. The phrase 'big melting pot' really rings true of the cultures in Brazil, Brazilian traditions and the Brazil people. 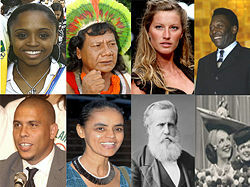 When you consider Brazil's vast landscape, its indigenous people, the eclectic mix of immigrants who also brought a wide variety of their own country's cultures, traditions and cuisines, it is little wonder that the traditions and cultures of Brazil today make up a unique and rich blend of diversity in itself. What are Brazil's people Like?